and then I didn’t really know what to expect. 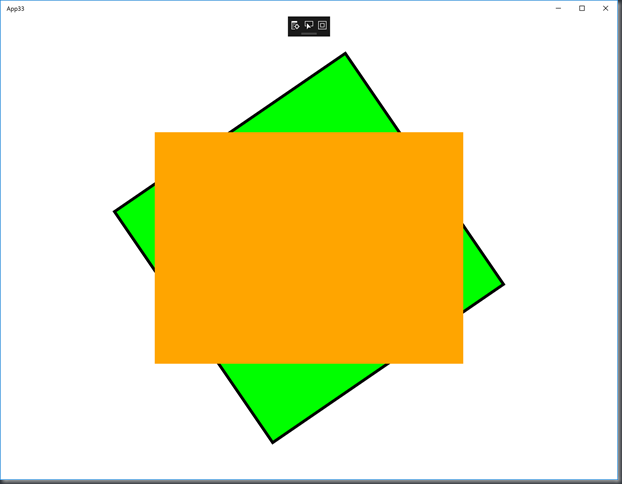 The orange ‘visual layer’ rectangle completely obscures the green ‘XAML’ and so I had a split expectation around whether the green rectangle would or would not still receive the touch events that let it be rotated and scaled. 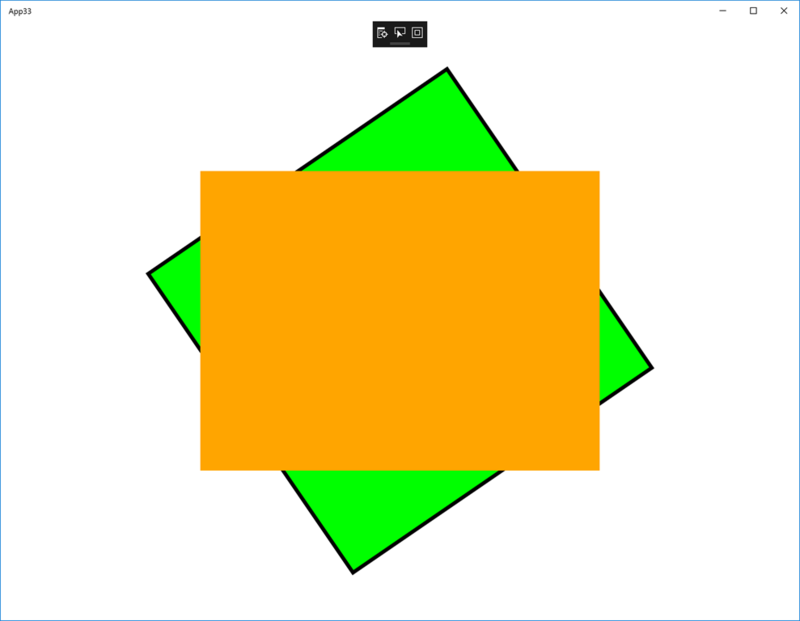 So, from the point of view of the touch events travelling towards the green rectangle, the orange rectangle painted by the Visual layer seems to be invisible and the events pass through it. That some work was done in the November update such that some of the hidden inner-workings of a XAML ScrollViewer have been surfaced via a ManipulationPropertySet. PropertySets are explained in that same article and I came across them in this post and they’re interesting in the way in which they can be used in expression based animations. 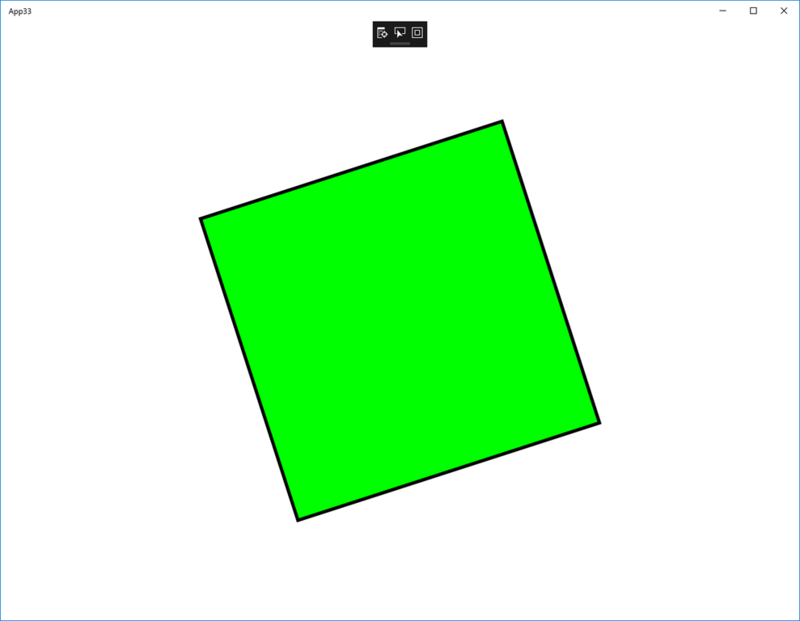 Based on that initial description, in my mind I’m thinking of this a little bit like the XAML-based manipulation engine which I made use of to rotate and scale my green rectangle without ever having to write the explicit code to handle the pointer events and so on but it remains to be seen as to whether that’s a good or bad analogy. Having watched the video, I felt that I mostly understood it from the point of view of a set of concepts but I didn’t feel that I’d actually be able to code it myself and so I thought that I should give that a whirl to get a feel for it and so I switched to my development machine running the Anniversary Update and tried to make a ‘Hello World’ on the latest preview SDK. // VisualInteractionSource and InteractionTracker are set up and used. // figured out why yet. // really want interactions on that rather than the whole window. // blog posts so becomes 'boilerplate' to some extent. Pass on pointer events from the window to the VisualInteractionSource. 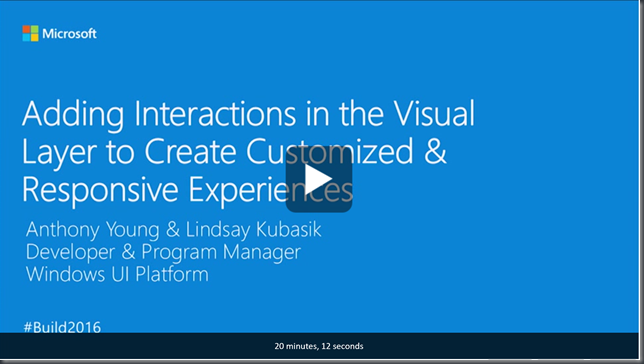 Set up the InteractionTracker in the first place along with the VisualInteractionSource which feeds it the events. In setting up that InteractionTracker in the method CreateInteractionTracker, I try to limit it to scale between 1.0 and 2.0 and it’s worth saying that the UI allows me to go beyond those limits and then ‘snaps back’ to them when I complete a pinch gesture. The other thing that happens within that method is the somewhat magical tie-up between the InteractionTracker and the visual which is done by the expression animation. That is – neither the Visual nor the animation need to know anything about the InteractionTracker because it’s just producing a bunch of properties (in a PropertySet) and the expression animation already knows how to deal with expressions that come from PropertySets. The code works, I can scale the rectangle as intended. One thing I’d flag is that I expected to be able to do rotation here and either it’s not in the bits that I have here or I’m missing how to do it as I can only see how to pick up changes to the scale and to the position. I don’t know about other gestures like rotate, flick, etc. I’d like to try and do something a bit more “realistic” with this capability. Naturally, there are the demos in the video referenced above which look really nice but I’d like to create something simpler of my own to try this out on. That’ll be a follow on post as will some sort of experiment around what it’s like to have interactions at both the XAML layer and the Visual layer. Great text. How about InteractionTracker’s performance? Now in my app I’m using Xaml to catch ManipulationDelta event with Composition to change Visual’s position and sometimes it can be laggy. That said, I think the idea of the Visual Layer is to offer great performance and low latency and the idea of the InteractionTracker seems to be to support a scenario where the user’s interactions can be linked with Visual Layer manipulations *without* having to involve (switching to) the UI thread at all. So, I’d expect that to be more performant than involving the ManipulationXXX events which involves switching over to that UI thread.